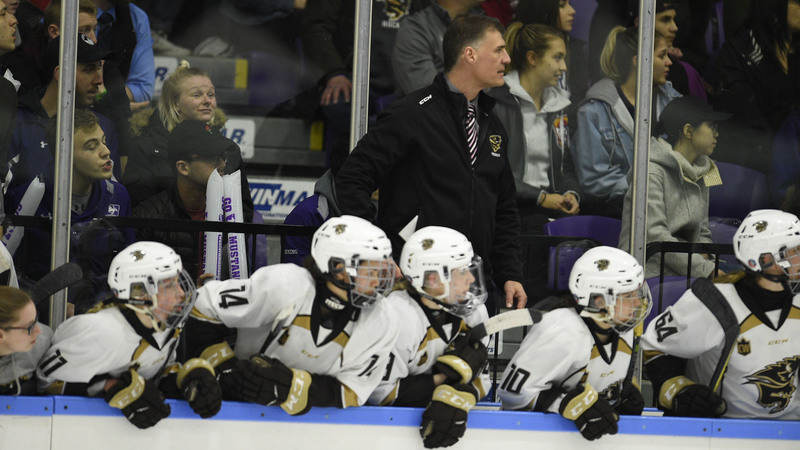 The Manitoba Bisons were looking to make it two wins in a row in their weekend series at Mount Royal, and nearly did so if it wasn’t for the Cougar’s resiliency on Saturday afternoon. The home side responded from trailing three times in the game and topped the Bisons in a shootout by a 4-3 score. Courtlyn Oswald opened the scoring for Manitoba at the midway point of the period when she tucked a close shot under the bar, beating goalie Jess Ross. Less than three minutes into the second, the Cougars drew level. The goal was initiated by seeing-eye shot, as Sarah Weninger shoveled the puck on goal while on the ice and it found its way in for the equalizer. With just over five minutes left in the frame, Manitoba turned a defensive odd-man rush in the other direction. Erica Rieder fed Lauryn Keen for her second goal of the series and the go-ahead goal for the Bisons. Two minutes later, the Cougars responded again with Jocelyn Froehlich firing her shot through traffic and beating Dyck to level the game again. At the midway point of the third period, Alannah Sharman managed to gather the attentions of three defenders to tee up Oswald for the 3-2 lead – her second goal of the game. However five minutes after going down, the Cougars leveled the game for the third time. Rachel Piitz picked out Megan Carver in the slot to beat Dyck with 4:05 left on the clock. When overtime solved nothing, the game headed into a shootout. Janessa Jenkins scored on her first shot for the Cougars, while the Bisons were unsuccessful in their next two attempts. Weninger picked the top corner against Dyck to clinch victory for Mount Royal. With some much needed motivation, the Bisons return home next week to start a four-game homestand against Mount Royal and Saskatchewan, respectively.